Pre-Health professions student Joshua Perese was drawn to the medical profession by a desire to help people, but he isn't waiting to finish school to get started. 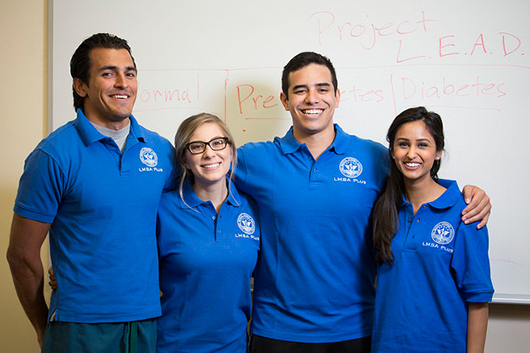 This spring he is helping launch Project LEAD (Lifestyle and Education Against Diabetes), a student-initiated program that aims to work with schools, churches and other local community groups to educate populations at-risk for diabetes. In addition to offering presentations and handouts, Project LEAD will host activities like hikes through the Fullerton Arboretum and scavenger hunts around the CSUF campus. 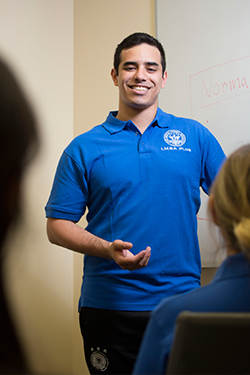 "We want to introduce healthy activities and educate people about diabetes, but we don't want to be seen as instructors leading a class," said Perese, who also serves as the External Outreach Coordinator for CSUF's Latino Medical Student Association. "We want our offerings to be enjoyable, and to create a team dynamic where everyone feels like they are working toward a common goal." This last aspect is especially crucial to Perese, who saw his grandfather suffer with, and eventually pass away from, diabetic complications. "He didn't trust the health-care system. Even when his condition got very severe, he still thought doctors were just after money," he said. "That's why Project LEAD offers free services, and why we want to create a dialogue with — not a lecture to — community members." Perese's outreach isn't limited to the local community. He is also raising money for the Peruvian American Medical Society (PAMS), which sends medical missions to Peru that provide treatment for rural populations and training for healthcare providers. This summer he plans to travel to Huancavelica, Peru to volunteer in a free clinic. Both Project LEAD and PAMS have attracted the involvement of several Pre-Health Professions students, who are placed in cohorts for the two-year program. Perese credits the positive group dynamics within his cohort for helping inspire his own outreach work. "One of the great things about this program is that you are with people with similar goals — we all want to get involved and help people," he said. "When you put people with those similar mindsets into a room, great things can happen."